with the book sale for more than 60 years. Jane Leitch is the grand dame of literary volunteers, and this year, the 86-year-old will carry on her tradition at the Association for Continuing Education’s 65th Annual Case Western Reserve University Book Sale 2011. The sale, which launched in the late 1940s under Leitch’s sister Carolyn, takes place May 21-24 in Adelbert Gymnasium. 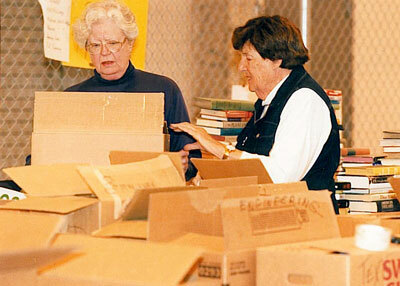 Some of the more than 75,000 books organized for sale in 12 different book departments from art to travel, were picked up and delivered by Jane, who carries on her sister’s devotion to the event. The sale has grown from a few thousand books in its early years to what it is today – tables and tables of books from one end of the gym to the other. They fill the air with the familiar scent of printer’s ink and paper. In the many, many boxes of books donated annually to the sale, there are always a few gems, said Eric Jacobsen, who is a volunteer co-chair of the sale along with Joanne Blazek. Some are delivered in bags and some in more unusual containers. This year, a suitcase arrived filled with works by the German writer Johann Wolfgang von Goethe. The buyer will get the suitcase and Goethe. Other sale gems this year include Art of Winslow Homer, The Buddy Series, Young Adult Mysteries, Jewish Art and Civilization and American Art: from its Beginning to the Armory Show. Jane Leitch started out as a volunteer at the sale doing odd jobs, picking up books and manning the textbook department. This year, she stands out as one of the sale’s longest working volunteers. She still pitches in at various departments when help is needed, but she now primarily lends a hand picking up and delivering books to campus with her brother Jimmy. The book sale continues to be a family affair even after Carolyn’s death in 1993. Jane and dozens of other volunteers keep it going. The sisters were part of the Sutphin family of four girls and two boys. Their father Albert Sutphin started The Braden Sutphin Ink Co. on East 93rd Street nearly 100 years ago. He also owned the Falcon hockey team in 1934, which he renamed the Cleveland Barons. He spearheaded the building of the old Cleveland Arena around East 36th Street and Euclid Avenue. Jane recalls that her father wanted his daughters to attend college in Cleveland and marry Cleveland men. The sisters attended Flora Stone Mather College, now part of Case Western Reserve University. They each married a Leitch brother and raised their families in Cleveland, another order from their father, whom Jane said guided the family with a firm hand. The Sutphin children eventually gave their father 28 grandchildren — 11 from the Leitch families. This year’s sale hours are Saturday, May 21, from 10 a.m. to noon (preview, $20 fee). Free hours begin Saturday at noon and go until 5 p.m. They continue Sunday, May 22, from noon to 5 p.m. (coupon day); Monday, May 23, noon to 3 p.m. (reduced prices); and Tuesday, May 24, 10 a.m. to 1 p.m. ($5 box sale).